The picture is showing a burial from the early Christian period, probably in Rome, in a catacomb. 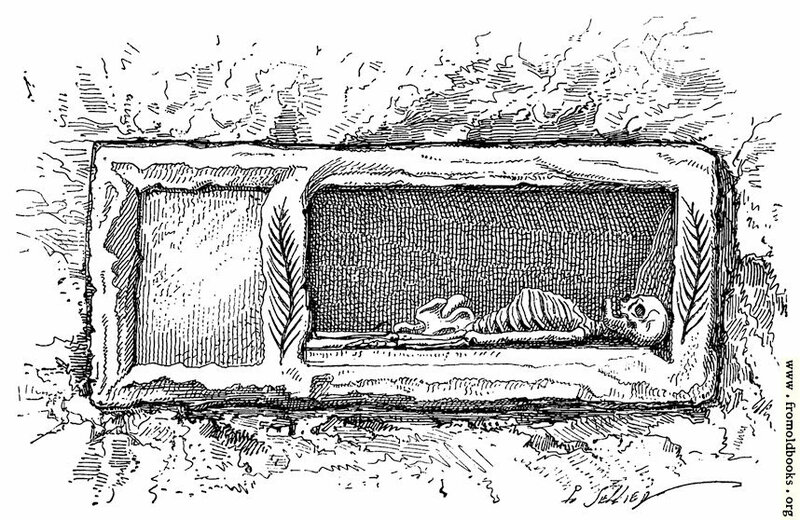 A rectangular tomb set into a wall, large enough for the dead occupant to lie down with a little head room above; one stone panel has been removed, the larger that would have borne any inscription, and through it we see inside a skeleton, with the skill up against the right-hand end; the lower legs from feet to knees are hidden by a smaller panel, still in place. Actually if the trumpet sounded and the dead all sat up in their graves this person would get a ore head on the stone roof of the chamber, showing perhaps that even then people didn’t really believe in a bodily resurrection. As St. Paul so often proposes Him for the model of our resur­rection, and speaks of our being buried with Him in baptism, it was natural for His disciples to wish to be buried after His example, so as to be ready to rise with Him. This lying in wait for resurrection was the second thought that guided the formation of these cemeteries. Every expres­sion connected with them alluded to the rising again. The word to bury is unknown in Christian inscriptions. “Depos­ited in peace,” “the deposition of ——,” are the expressions used: that is, the dead are but left there for a time, till called for again, as a pledge, or precious thing, intrusted to faithful, but temporary, keeping. 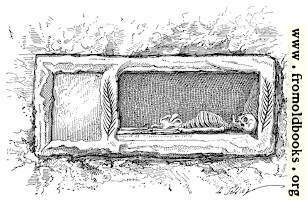 The very name of cemetery sug­gests that it is only a place where many lie, as in a dor­mitory, slumbering for a while; till dawn come, and the trumpet’s sound awake them. Hence the grave is only called “the place,” or more technically, “the small home,” of the dead in Christ. Footnote: that is, in Latin, Locus, loculus.